NTA UGC NET 2019 Official Notification Released and Exam from June 20, 2019 to June 28, 2019: It is notified that NTA will conduct the next UGC-NET for Junior Research Fellowship & Eligibility for Assistant Professor from June 20 to 28, 2019. The candidates who desire to appear in the test may see the detailed notification available on the website from March 1, 2019. The National Testing Agency (NTA) will activate the National Eligibility Test (UGC NET) 2019 application form link on March 1 while the exam will be held on June 20 to 28 2019. The detailed notification will release at NTAnet.nic.in. The last date to apply online is March 30, while the fee can be paid until ................. On behalf of UGC, the National Testing Agency announces holding of the National Eligibility Test (NET) on June 20 to 28, 2019) for determining the eligibility of Indian nationals for the Eligibility for Assistant Professor only or Junior Research Fellowship & Eligibility for Assistant Professor Both in Indian universities and colleges. NTA will conduct NET in 83 subjects at 88 selected NET Examination Cities spread across the country. 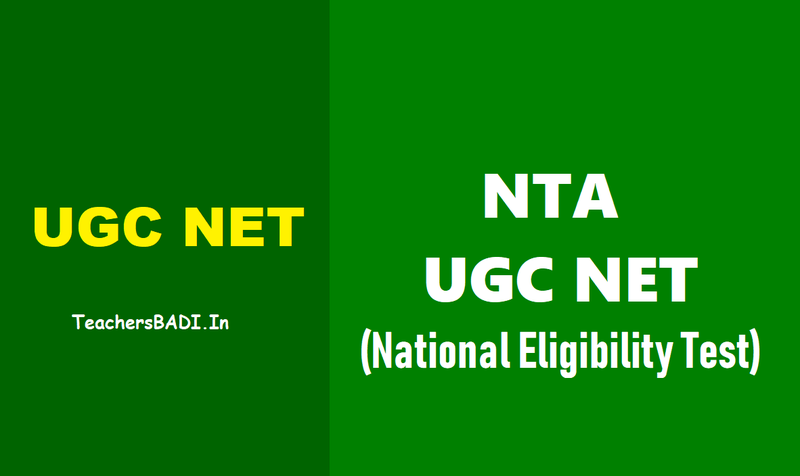 NTA UGC NET/National Eligibility Test for June 2019, June 20 to 28, 2019: NTA UGC NET 2019 is scheduled to be conducted from June 20 to 28, 2019 by the National Testing Agency (NTA), New Delhi for candidates interested in pursuing Junior Research Fellowship and/or Assistant Professorship, as reported by various news reports. Although there is no notification on the official website of NTA, but various reports suggest that the official information bulletin will be out on 1st February 2019. What is Expected to be Changed? As per the reports, NTA has increased the upper age-limit for the Junior Research Fellowship (JRF) aspirants from the current 28 years to 30 years, while keeping the age-relaxation rules same as before. The NTA UGC NET June 2019 exam will comprise of two papers only. Paper 1 will consist of 50 compulsory questions that will carry 2 marks each, while Paper 2 will consist of 100 compulsory questions that will carry 2 marks each. Candidates will be given 1 hour to attempt Paper 1 and 2 hours to attempt Paper 2. Paper 1 will carry total 100 marks while Paper 2 will be of 200 marks in total. i) Candidates who have secured at least 55% marks (without rounding off) in Master’s Degree OR equivalent examination from universities/institutions recognised by UGC (list attached page No. 21 to 47) in Humanities (including languages) and Social Science, Computer Science & Applications, Electronic Science etc. (list of subjects of post graduation attached at page No. 18 to 19) are eligible for this Test. The Other Backward Classes(OBC) belonging to non-creamy layer/Scheduled Caste(SC)/Scheduled Tribe(ST)/ persons with disability(PWD) category candidates who have secured at least 50% marks (without rounding off) in Master’s degree or equivalent examination are eligible for this Test. v) Candidates are neither required to send any certificates/documents in support of their eligibility nor printout of their Application Form (Confirmation Page) to NTA. However the candidates, in their own interest, must satisfy themselves about their eligibility for the Test. In the event of any ineligibility being detected by the UGC/NTA at any stage, their candidature will be cancelled and they shall be liable for legal action. (i) Junior Research Fellowship: Not more than 28 years as on 01.01.2019. A relaxation up to 5 years is provided to the candidates belonging to OBC (Non- creamy layer, as per the Central list of OBC available on website: www.ncbc.nic.in ) SC/ST/PWD categories and to women applicants. Relaxation will also be provided to the candidates having research experience, limited to the period spent on research in the relevant/related subject of post-graduation degree, subject to a maximum of 5 years, on production of a certificate from appropriate authority. Three years relaxation in age will be permissible to the candidates possessing L.L.M. Degree. Total age relaxation on the above ground(s) shall not exceed five years under any circumstances. i) NET/SLET/SET shall remain the minimum eligibility condition for recruitment and appointment of Assistant Professors in Universities/Colleges/ Institutions. Provided however, that candidates, who are or have been awarded a Ph. D. Degree in accordance with the University Grants Commission (Minimum Standards and Procedure for Award of the Ph.D. Degree) Regulations, 2009, shall be exempted from the requirement of the minimum eligibility condition of NET/SELT/SET for recruitment and appointment of Assistant Professor or equivalent positions in Universities/ Colleges/ Institutions. Important Dates: UGC NET would be conducted in June by NTA, its first exam as in its capacity as a newly formed examination agency. The detailed notification is yet to be released by the organisers, but it can be expected any time. Step 3: You’ll be taken to a new page. Follow the steps as given and make the corrections. Step 4: Make sure you check every detail entered twice as you won’t be able to make changes again. Step 5: Make sure you take a print of the page after you make the required changes or payment. The application process had begun from August 11 this year and ended on ... 2019. The exam fee for general category candidates is Rs 1000, for OBC is Rs 500 and for reserved classes is Rs 250. It is to notify to all the Registered Candidates of UGC NET June 2019 that the facility of downloading the admit card will be operational in June 2019 on the website www.NTAnet.nic.in. The National Testing Agency (NTA) would be released the admit card of candidates for UGC National Eligibility Test (NET) June 2019 examination. The examination will be held on above dates. Candidates can download their admit card from NTA’s UGC-NET official website. Candidates should check the admit card for any discrepancy in details and also check the venue of the examination. NTA was earlier expected to release the admit card of candidates for NET on June 11, 2019. The exam is conducted to determine the eligibility of candidates for the posts of assistant professor and Junior Research Fellowship. Candidates who qualify for the JRF are eligible to pursue research in the subject of their post-graduation or in a related subject and are also eligible to apply for the post of an assistant professor in Indian universities and colleges. The award of JRF and eligibility for assistant professor’s post depends on the performance of the candidate in all the three papers of NET. However, candidates qualifying exclusively for an assistant professor are not considered for JRF. Candidates who have scored at least 55% in their master’s degree are eligible for NET. The exam is conducted twice every year. The exam will be conducted in 84 subjects in 90 cities across the country. Here are some things you should know before you enter the examination hall on Sunday. NTA UGC NET 2019: With only three days to go, candidates are looking for the best way to prepare for the exam. The National Testing Agency (NTA) will conduct the National Eligibility Test (NET) for the post of assistant professors on June 2019. Candidates are looking for the best way to prepare for the exam overseen by the University Grants Commission (UGC). Here are some things you should know before you enter the examination hall on Sunday. You have to clear three papers in order to crack NET. Paper I will test your aptitude for teaching and research. The questions, here, are designed to check your ability to reason, comprehend and your general awareness. You will have to answer 50 out of 100 questions within the time span of one hour and 15 minutes. Take note that if you answer more than 50, only the first 50 will be taken into account. This paper carries a total of 100 marks. Paper II is the subject-based paper. You will be asked 50 objective-type questions based on the subject of your choice. Each question in this paper will carry two marks, with a sum total of a 100 marks. There is no negative marking, so make sure you do not leave any question in the one hour and 15 minutes that you are given. Stay healthy.. A healthy body is as important as a strong mind. Make sure you eat well and sleep on time. Any imbalance in diet and sleep can effect your memory and performance during the examination. Mock tests.. With only three days to go, you must utilise this time to go through at least one mock test a day. As they say, practice makes the man perfect. Taking mock tests and attempting previous years’ papers will give you an idea of what questions may come up in the examination. It will also help in figuring out how to toggle between sections and how much time to put where. Revision.. Stick to your notes and all the basics. Go through all that you have already learnt and scan through the more elaborate topics. Do not start with anything new. Trust what you know.. Now that there is limited time left for the UGC NET exam, there is no point in picking up a new topic and trying to learn a new subject. You must believe in your preparation and concentrate on what you know. 1. The candidates shall have to bring black ball Point pen to the Examination Hall. Candidates should use only black ball point pen to write particulars on the cover page of the Test Booklet, Answer Sheet and for darkening the circles of responses. Use of pencil or any other means is strictly prohibited. 2. The candidates are advised not to bring any items mentioned at serial number 12(a) including bags, metallic items etc. as there may not be any arrangement for safe custody to keep these items at the examination centres. In case of any loss of any belongings, the candidates will themselves be responsible. 3. All the examination halls/rooms shall have a wall clock, Hence the candidates are not allowed to wear/carry any type of watch into the examination hall/room. 4. Candidates are requested to read carefully the detailed Notification for NET to be held on ... available on the website: www.NTAnet.nic.in. No TA will be paid for appearing in the Test. 5. Candidates are allowed to carry the Test Booklets of Paper-I, II and III after conclusion of the examination..
6. Venue of Test : Candidates are requested to visit the Venue of the Test, a day before the examination so as to reach in time on the day of examination. The request for change of City/Centre of examination/Subject will not be entertained. The candidates are permitted to appear at the allotted venue of test only. No candidate will be allowed to appear in the examination at any other centre of examination other than the allotted center. The candidate should sit on the seat allotted to him/her only. 7. Candidates shall have to be present at the examination Centre by 7.00 am (IST) for Paper-I and by 1:30 pm(IST) for Paper-III i.e. atleast 30 minutes before the commencement of the examination. Since the time gap between Paper - I and Paper - II is only 30 minutes no candidate is allowed to leave the examination hall/centre after Paper - I. 8. No Candidate, in any case, will be allowed to enter the Examination Centre after the commencement of the examination in each paper. 9. The candidate has to appear in the Paper - II & Paper - III in the subject mentioned in the admission card.Change of subject is not allowed. 10. Entry to the Examination Hall will not be allowed without this admission card. Candidates should also bring along with them a valid photo ID proof for verification..
11. No candidate will be allowed to leave the examination hall/ room before 12:30 P.M. in the 1st session and 4:30 P.M. in the 2nd session. a. The candidate(s) found with any electronic devices/Cellular phone/Mobile/Pager/Calculator/Log Tables/copying material/books/notebooks/bits of paper/ any other written materials. b. The candidate(s) found talking to each other or discussing any matter during the examination or the candidate(s) found disturbing other candidates in the examination room/hall and not maintaining complete silence. c. Candidate(s) found removing any page(s) from the Test booklet and if any page(s) is/are found missing from his/her Test Booklet. d. The candidate(s) not following the instructions given by the invigilators in the examination hall and found arguing with the invigilators/other staff involved in the examination duty at the examination centre. e. The candidate(s) found sitting on the seat other than that seat allotted to him/her, appeared at other centres or appeared in other subject than that mentioned in the admit card. 13. The Physically Challenged(PwD) candidates must carry a copy of the disability certificate in the prescribed format of the Govt. of India otherwise the relaxations mentioned at serial no. 9 page 8 of the information bulletin of NET June 2019 will not be provided to him/her during the examination. 14. It may be noted that the admission card will not be sent to the candidates by post separately. Candidates should note that their candidature is strictly provisional. The mere fact that admission card has been issued after online submission of application form and the candidate is allowed to appear in the test shall not imply that the NTA/UGC has finally accepted his/ her candidature. 16. It would be the responsibility of the candidate to ensure that the serial number and code number of the Test Booklet is same that of OMR sheet. If any discrepancy, report to invigilator to get change.